Firstly, you can leave them in like they are. This will only be good if you are using safety pins and hand quilting, or are using normal pins but quilting with a long armed quilting machine. Secondly, you can use basting (or tacking) and then remove the pins. Tacking will give you the ability to move around with your quilt, without having to worry about whether it is going to fall apart or gather when you move it. Using a loose and very wide running stitch, start in the middle of the top end of the quilt and follow one line of pins. Your stiches should be about an inch long and an inch apart. After you have finished quilting you will pull them out, so it is a good idea to use a brightly color thread or one that contrasts to your quilt tops colors. (For example if you have a bright red, orange and yellow quilt then perhaps blue or white cotton would be good as you will be able to see it easily when removing it). 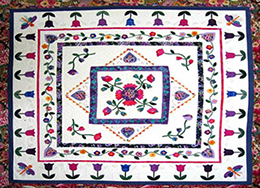 Whether you hand quilt or machine quilt, tacking is really the best way of holding the quilt together. It is simple to do and simple to remove and gives you the assurance that your backing wont pucker or bubble!